The name might be scary but the grammar is easy: a periphrastic tense is a verbal construction consisting of a specific semi-auxiliary verb plus an infinitive. These verbal phrases offer additional nuance to the normal range of verb tenses. French has three periphrastic tenses, each of which can be used with the semi-auxiliary verb conjugated into the present tense or the imperfect. Il vient de me regarder. He just looked at me. Je viens de manger. I just ate. Il venait de me regarder. He had just looked at me. Je venais de manger quand il est arrivé. I had just eaten when he arrived. Il est en train de regarder la peinture. He is looking at the painting. Je suis en train de manger. I am eating. Il était en train de regarder la peinture. He was looking at the painting. J’étais en train de manger quand il est arrivé. I was eating when he arrived. Il va regarder l’horaire. He’s going to look at the schedule. Je vais manger. I’m going to (am about to) eat. J’allais manger quand il est arrivé. I was going to (was about to) eat when he arrived. 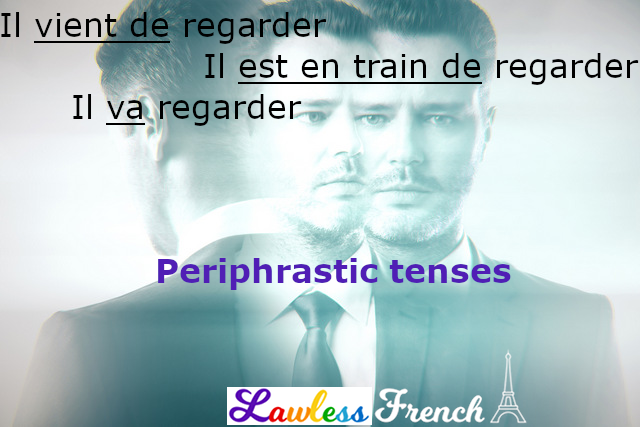 Periphrastic tenses are one type of verbal periphrasis (périphrase verbale); the parent category also includes compound tenses (like the passé composé) and progressive tenses (which don’t exist in French). The meaning of the examples you give depends on the context of the preceding sentence or paragraph. Of course if you throw a sentence out in the air just for the sake of saying any old thing and with nothing to give it context, you won’t know which meaning is correct. People very rarely speak or write in this fashion however. Laura’s examples are correct and accurate whether you’re speaking English in the U.K., the U.S. or in Canada for that matter. Thank you for this. It’s really useful for those in the throes of learning French, especially High School students. However, your translations of ‘He just looked at me’ and ‘I just ate’ do not have the same meaning in English English as they do in American English. In English English, ‘I just ate’ gives the impression that one had a choice of doing one thing or another, ie., to ‘eat’, or to eat and, for example, drink. In recounting the episode to someone, one would, for example, say:- “I was invited for a drink and something to eat, but “I just ate”” (ie., I only had something to eat, not something to drink). 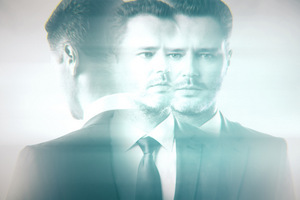 Similarly, “He just looked at me”, in English English, implies that the first party was, perhaps, ‘simply looking at someone else’ when that someone else was expecting other actions from the first party, for example, the first party to say something, do something else, rather than ‘simply look at’ the second party. The translation for both of these, in English English, is:- “He has just looked at me” and “I have just eaten” – in both cases the inference being that the event had literally just taken place, right before the narration of the event to a third party.